Previews began March 13, 2015. Opens through June 21, 2015. Written by David Hare. Directed by Stephen Daldry. On a bitterly cold London evening, schoolteacher Kyra Hollis (Carey Mulligan) receives an unexpected visit from her former lover, Tom Sergeant (Bill Nighy), a successful and charismatic restaurateur whose wife has recently died. As the evening progresses, the two attempt to rekindle their once passionate relationship, only to find themselves locked in a dangerous battle of opposing ideologies and mutual desires. David Hare's Skylight originally premiered at the National Theatre in London in 1995 before going on to play smash-hit engagements in the West End and on Broadway the following year. When the 2014 production of Skylight opened in the West End in June it was praised by critics on both sides of the Atlantic. The Guardian said, "Hare's play hits you straight between the eyes with its mixture of private pain and public rage at our profoundly polarised society," while The Observer declared, "Stephen Daldry's production dances—it is a high-velocity encounter between two exceptional actors. This is a pivotal play." 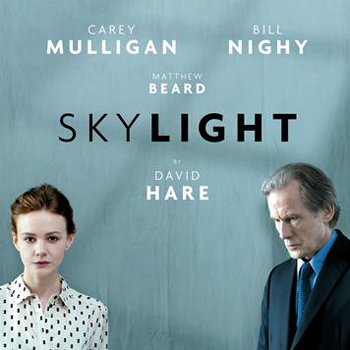 Variety said, "Carey Mulligan and Bill Nighy are so perfectly matched and balanced—watching them lock horns is riveting," and The Mail on Sunday called Skylight "tense, moving, magnificent within a hair's breadth of perfection." The Washington Post described it as "a pinnacle event—an artfully crafted piece of penetrating drama. Stephen Daldry's flawless staging explores the fissures among the characters so potently that the evening hums along on what feel like the vibrant currents of life as it is actually lived. Exceptional is the adjective that comes to mind." The Telegraph summed it all up by proclaiming, "West End productions don't come any better than this."